Energy efficient windows again ranked as green feature commonly used by the most remodelers in NAHB’s Remodeling Market Index (RMI) survey for the first quarter of 2015. 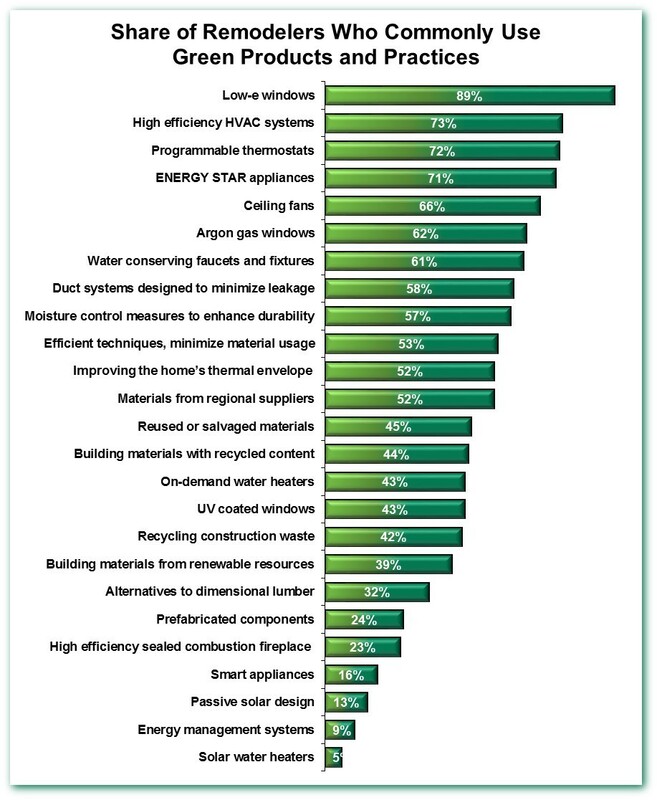 Nearly 9 out of 10 remodelers surveyed said they’d commonly used low-e windows during the past year. Next on the list were high efficiency HVAC systems, programmable thermostats, and ENERGY STAR appliances, each commonly used by a little over 70 percent of remodelers. These are similar to the results we reported at this time last year. NAHB’s surveys tend to define green broadly, so the term encompasses substantially more than narrowly defined energy efficiency. Moisture control, for example, is included, because it results in some components of the home needing to be replaced less often, reducing environmental impacts associated with manufacturing, transporting and installing those components over time. The list of 23 green products and practices in the RMI survey is based on the major sections of the National Green Building Standard (NGBS)—which can be applied to remodeling as well as new construction. In addition to moisture control, water conserving faucets and fixtures, efficient construction techniques designed to minimize material usage, and materials from regional suppliers (reducing the environmental and other costs associated with transporting materials to the construction site), are examples of green products and practices that go beyond simply-defined energy efficiency and are commonly used by over half of NAHB’s remodeling members. NAHB’s RMI questionnaire has periodically included special questions on green remodeling going back to the survey’s inception in 2001. The categories were altered substantially after 2011—when the NGBS became available—however, so not all of the current items on the list can be compared to the early history. 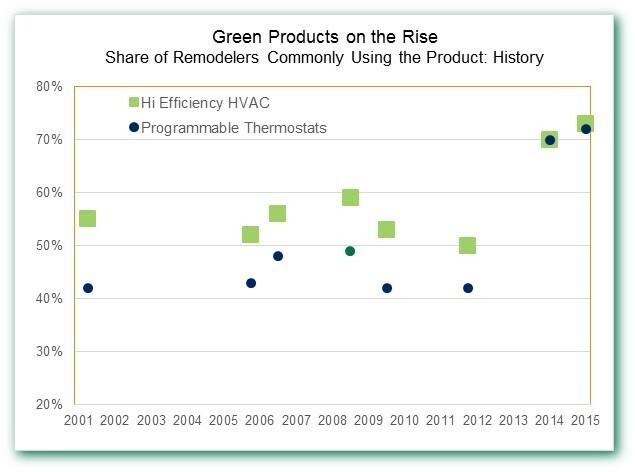 Of the green features that have been covered in a consistent way since 2001, high efficiency HVAC and programmable thermostats are the ones that have grown notably more common over time. Under 60 percent of remodelers (usually well under) reported using these products commonly in the 2001-2011 period, compared to 70 percent-plus in 2014 and 2015.